Onew (??) means 'gentle' and 'warm'. Wonho (??) means 'to protect'. Baro (??) can mean a variety of things: 'straight', 'proper', or 'immediate'. Sandeul (??) is used to describe a gentle breeze. Shindong (??) means 'child prodigy'. Junjin (??) means 'to go forward'. Because of Junjin and Hyesung, Shinhwa's introduction is '???? ???? ', meaning 'going forward like a comet'. Changjo (??) means 'to create'. Chunji (??) means 'heaven and earth', and is also used to describe 'everywhere'. While it may not seem like it, B-Bomb (??) is actually a stylish way to write the Korean word that means 'extraordinary'. Baekho (??) means 'white tiger'. 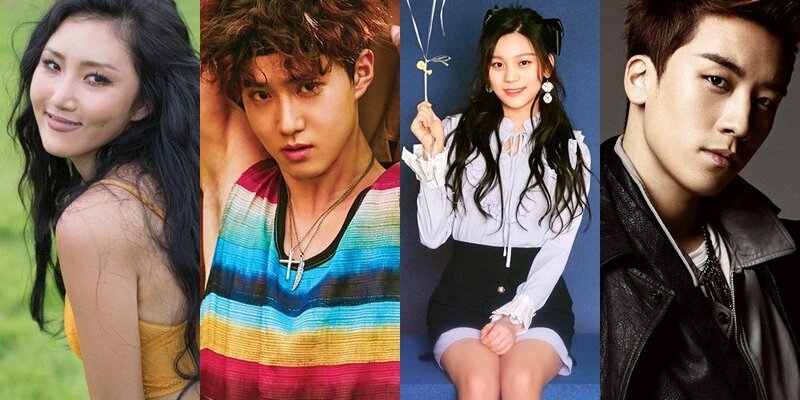 Suho (??) is another word for 'protect', and 'guard'. EXO's leader is the protector of EXO. 'Seungri' (??) means 'victory'. If you watch League of Legends in Korean (LCK or Twitch streamers) you'll see ?? at the end of the game if they win. Soyu (??) means 'to possess'. Hwa Sa (??) means 'bright'.